A family is calling for more research into sudden death among young people as it claims a mobile phone ring may have sparked their daughter's death. Kasia Ber, 17, who had an undiagnosed heart problem, died in bed at her parents' County Durham home last year. Subsequent tests showed she had the genetic disorder Long QT syndrome, which is treated with beta blockers. Her family want more research into how sudden shocks or noises, like phones, can trigger potentially fatal attacks. The family, from Horden, is raising money, and awareness, for the Cardiac at Risk in the Young (CRY) charity, in memory of the teenager, who died last December. Miss Ber's 45-year-old father John said: "There are different varieties of this condition. "The one my daughter had was triggered by sudden noises, such as a mobile phone ringing and that is what happened to her. "The mobile phone went off and that's what we think brought the attack on. "She was absolutely beautiful, so bubbly and full of fun. "We want to get young people screened." Mr Ber's 42-year-old wife Diane also has the condition, but only found out after her daughter's death. Their son Christopher, 15, has been tested and given the all clear. 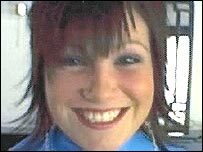 Mr Ber said: "My daughter might still be here today if this had been spotted." An inquest in Hartlepool heard evidence from Miss Ber's boyfriend Scott Wheatley, who said she began shaking when her mobile phone alarm went off on the morning of 28 December last year. She stopped breathing soon afterwards. Coroner Malcolm Donnelly recorded a narrative verdict that the teenager died as a result of an undiagnosed genetic condition. The cause of death was congenital fatal ventricular arrythmia brought on by Long QT syndrome.